An adaptation of the brilliant drama by Sophocles. The play about civil disobedience is interwoven with letters from the Vietnam Veterans Memorial; these letters are haunting, gripping mementos, prayers and expressions of grief. A portrait of loss, honor and reconciliation. 12 actors. The works of Käthe Kollwitz, an artist and activist of great renown today, were labeled degenerate during the Nazi regime. Wendall, branded a sexual degenerate, joins a subversive group that makes copies of condemned paintings to save the originals. He and Käthe become friends and support each other in their causes. 8 actors. Produced at The Invisible Theatre in Tucson, Arizona. 34 brief, dramatic moments in the life of Peggy Guggenheim, a famous collector of modern art. Peggy was a colorful and conflicted character; she was married several times, had an affair with Samuel Beckett, and had a tumultuous relationship with her children. Peggy was, in many was, a contradictory character; she was generous and tight-fisted, opinionated and open to suggestions, forgiving and a bearer of grudges. She was intimate friends with a vast assortment of famous American and European artists and writers. 6 actors. Tobias, a playwright, is exiled from Athens after he assaults Sophocles. Accompanied by his wife and children, Tobias travels though time with his cart of belongings. The family is transformed by the characters they meet: Strangers with Red Hands, Merchants on the Silk Road, Godot and his Nurse, Van Gogh’s Roommate, Lord Elgin, The Weird Sisters, and a Comedia Dell’arte Troupe. A celebration of theatrical conventions and characters. 7 actors. Winner: Art Inspires Grant. The natives of an idyllic island have been enslaved by a band of foreigners. When the island begins to sink into the sea, King Egar, the hedonistic ruler, ignores the crisis as pandemonium ensues. 14 actors. A collage of six classic myths with a contemporary twist: Medusa, who turns men into stone, Daedalus, sculptor and builder of the labyrinth, Zeus, whose father was tricked into swallowing a stone, Orpheus, whose music animates stones, Prometheus, bound to a rock for his generosity, and Teiresias, who was transformed into a woman after tossing a pebble at a snake. 9 actors. Dr. Roth, a neurotic scientist, travels the world to isolated research stations with his crew of misfits. The doctor’s wife, a crazed but insightful poet, accompanies them. While on assignment excavating toads, a bizarre stranger arrives; this visitor wields absolute power over the group, prompting them to reveal horrific secrets. 7 actors. Produced at the American Theatre of Actors in New York City. Produced by Ivy Productions at Walkerspace in New York City. Daedalus is a gifted sculptor and celebrated inventor who designed the labyrinth. The real source of Daedalus’ inspiration, however, is his saucy model, Lydia. His son, Icarus, is a sweet and insightful simpleton. His agent, Takus, is an ineffective capitalist. His most loyal customer, King Minos, plagues him with unusual demands. What more could go wrong - imprisonment, a misguided escape and life as a fugitive. A comic saga of a man who creates problems that others must solve. 10 actors. It is 2012. In the small town of Mayhem, a committee of ten eccentric people meet in city hall. Their task is to plan the celebration of their town’s anniversary. Among their duties, they are to design a time capsule, select items to be placed into the capsule and plan the internment ceremony. As they deliberate, the characters reveal secret passions, obsessions, prejudices and repressed rage. They also commit acts of kindness and generosity in the midst of identifying the soul and character of their town. 10 actors. A collection of eight folk tales from around the world. One is performed with marionettes; one is presented as a shadow puppet piece. 8 or more actors. Maxie convinces her husband, Zero, to campaign for leader of their country. With Horace as Campaign Manager, the trio embarks on a whirlwind of fundraising, cover-ups, debates, makeovers and scams. Meanwhile, Inspector Oodles assumes a variety of disguises to uncover the true identity of Zero and his cohorts. An outrageous fable, in the spirit of King Ubu, that lampoons politics. The dialogue is filled with invented words and malapropisms. 10 actors. 14 scenes. Presented at KCACTF (Kennedy Center American College Theatre Festival) Region 8 Festival. 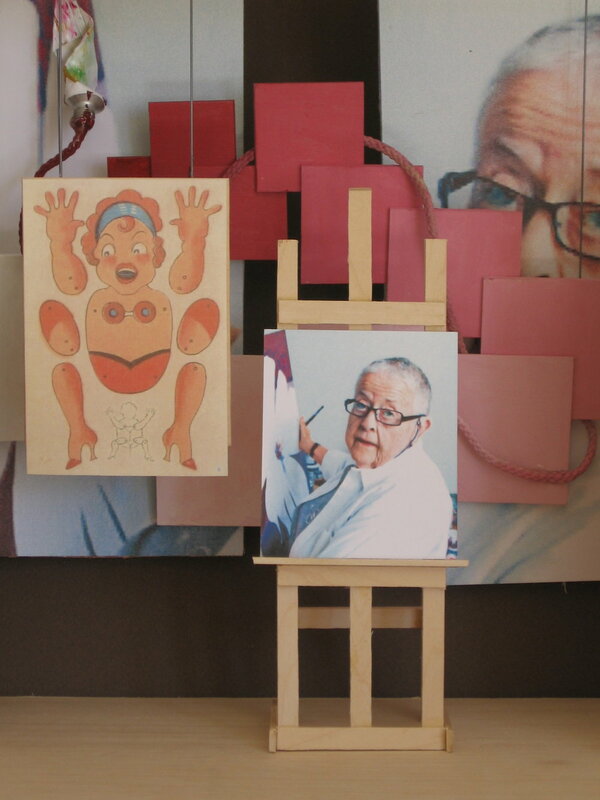 The amazing journey of legendary artist and activist, Ivy Bottini. Ms. Bottini, an Art Director for Newsday, was married for sixteen years and had two children. She became involved in the women’s movement and was co-founder of the NYC Chapter of NOW (National Organization for Women). After coming out as a lesbian, Ms. Bottini was expelled from NOW, at the urging of Betty Friedan. Ivy moved to Los Angeles and continued her activism. She fought California Proposition 6 (A initiative to expel gay and lesbian teacher from the classroom) and Proposition 64(A initiative to identify persons who were HIV+ and possibly quarantine them). She toured the country with a one-woman show, and hosted the radio show, “It’s a Gay Life.” Ms. Bottini is the recipient of the Morris Knight Lifetime Achievement Award and has been profiled in the film, “On These Shoulders We Stand.” The play is written in rhyming couplets and features 17 poems/songs. A group of young adults react to the shooting death of their friend, Trevor. Although their reactions vary - from destructive behavior to brutal honesty to political activism - they support each other with acts of kindness and courage.